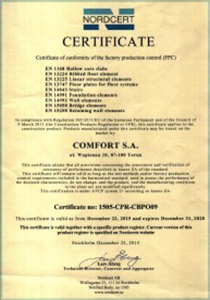 Quality Policy | Comfort S.A.
From January 1st, 2009. we are entitled to place the CE marking, Communité Européen’ (The European Community) on our products. The CE symbol is a declaration that our products meet the relevant European health, safety and environmental requirements. The certificate was granted to us by the Swedish Association for the Certification System NORDCERT. As of December 22nd, 2015, the Production Plant in Toruń has extended the range of certificate of standard EN 13224 Ribbed floor elements, enabling The Company to produce, among others, TT slabs. 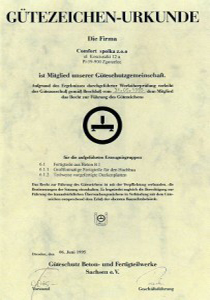 has resulted in the German certificate being awarded to our products – „Bestätigung der Gültigkeit der Übereinstimmungszertifikate”. 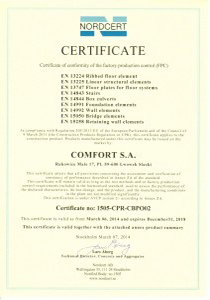 As a result of this, Comfort S. A. has the right to sell its prefabricated products on the German market. Our customers are supplied with a package of qualitative documents related to the prefabricated components which are necessary to hand over the construction. In spite of the stable quality of production, we are still working on the quality of our products so that they are compatible with the latest technologies and they are most responsive to increasing expectations of our clients. Comfort meets the Swedish quality requirements. 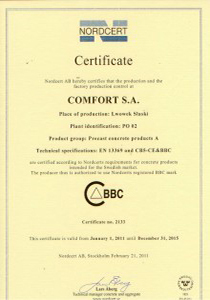 The highest standards of production resulted in the award of the NORDCERT certificate on 1 January 2007. 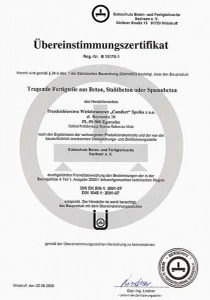 The Association of NORDCERT Certification System for Prefabricated Concrete Production Control states that our products comply with the standards and regulations of SS-EN 206-1, BKR and BBK and with the principles of BBC certification. The company carries out complete quality control based on Factory Production Control. It consist of a stand-alone inspection of every technological operation performed by the production department and laboratory tests supervised by Quality Control employees. The inspections are recorded in the “Technological Product Card”. On the basis of these documents it is always known who made the particular prefabricated item and where, and even the individual operation and who is responsible for its progress. Such a link between workers and responsibility has resulted in the attitude, that quality is a matter for each employee of our company. Thanks to impeccably functioning Quality Control and usage in production of all materials with the necessary approvals and certificates, our products are authorized for marketing and common use on the Polish market in accordance with the requirements of the norms and the Act of April 16th 2004. on Construction Products.